Photo by Ryan TrenkaSunny Southern California is famous for its white sandy beaches bordering the warm Pacific Ocean and palm trees blowing in the breeze. After my trip to California, I found myself singing the tune from the Beach Boys wishing that I too was a California girl, but not for the reasons that you may think. A mere 60 mile drive north of the big city of Los Angeles is a very special place in the heart of Southern California, the Tejon Ranch. This spectacular ranch takes you away from the hustle and bustle of the typical California life of traffic jams, honking car horns and shoulder to shoulder people to a place that its main inhabitants are Blacktail deer, Russian hogs and Rocky Mountain Elk. A coyote’s yip can be heard for miles across the historic 270,000 acre ranch, the largest of its kind in California. The Tejon Ranch’s history begins in 1843 as a Mexican land grant and is deeply rooted under the principals of long term conservation, ranching and farming. I met up with Dean Capuano of Swarovski Optik to film our adventures in the pursuit of Russian hogs and Rocky Mountain Elk for the 2014 season of Swarovski Optik Quests television show that airs on the Outdoor Channel. I never would have imagined that some of the biggest bull elk I have ever been blessed to hunt would be in California. Be sure to tune in and see for yourself how our adventure unfolds. 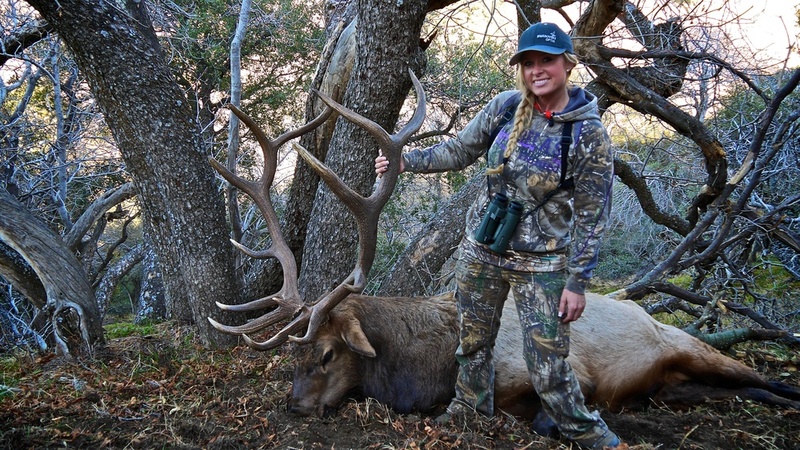 After seeing the Rocky Mountain Elk of Southern California you too will have a new appreciation of what hunting California has to offer the western elk hunter. 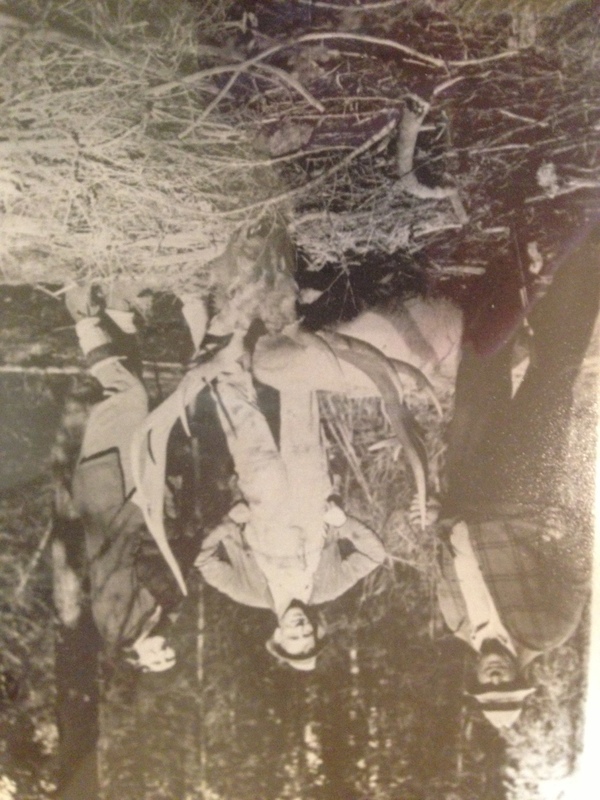 Paul Gilliland (middle) on a successful hunt. Over 100 years of cherished hunting stories and memories that have literally been the bonds of the Ellis family all took place on this awe inspiring ground. In the late 1800’s Sam and Ida Walker settled this land to begin their family, never knowing the legacy that they would be leaving behind. This has been the ground that many hunters trekked Verna Gilliland and her dog.across for their first and some for their last hunt. Those that have passed still fondly remembered today. A monster bull elk is proudly on display in the old farmhouse, taken by avid huntress, and daughter of the Walkers, Verna Gilliland. 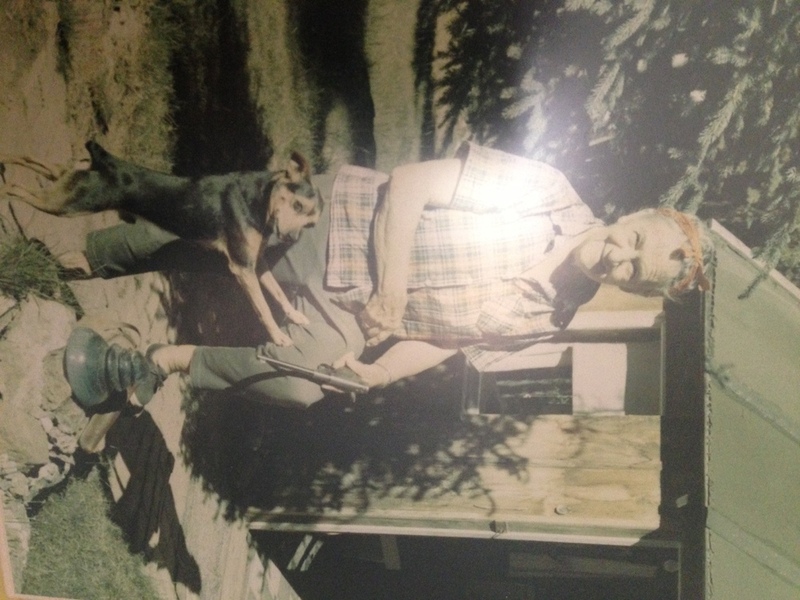 Her husband Paul’s old hunting license from 1911 can be found on the office wall today. At the time, Paul was a mere 21 years old. The love of the outdoors and continuation of the time honored hunting tradition is being shared by the Ellis family as it has been so for over three generations, this time with Jacob, his best friend Chase and Jacob’s father Keith. Both Jacob and Chase are exceptional 12 year old young men, both have a love of the outdoors and spirit of the hunt within each of them. 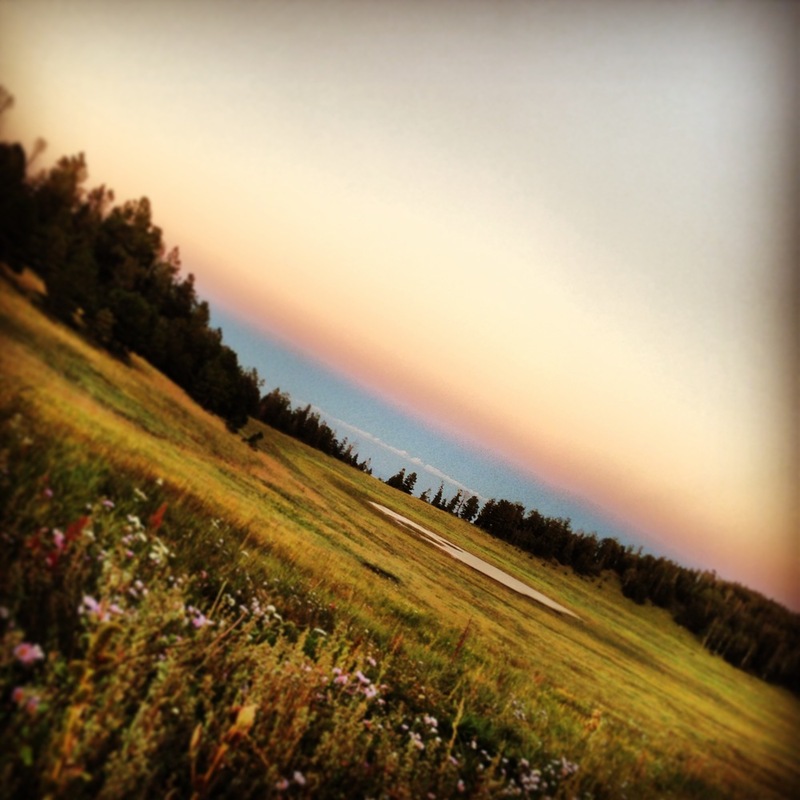 This was the perfect place for them to share together in the experience of Jacob’s very first elk hunt. Paul Ellis, Jacob & Chase in the field. 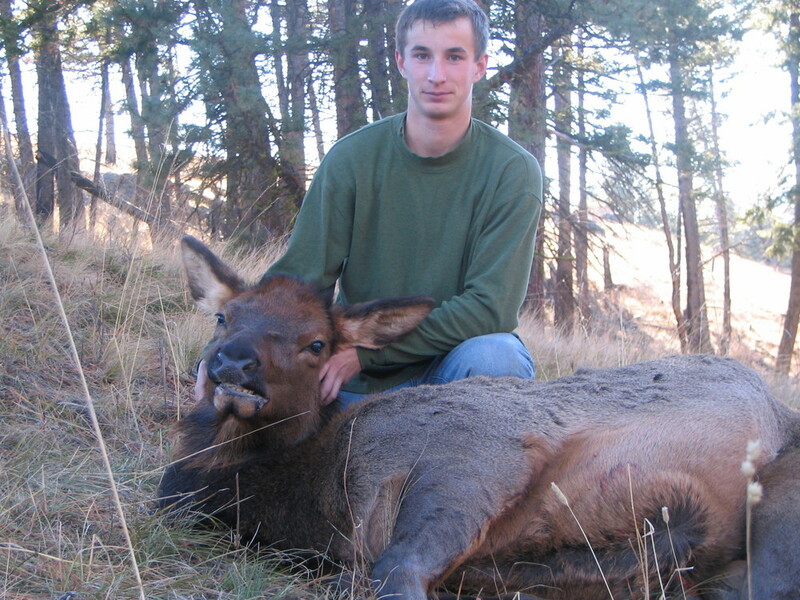 This hunt was a special first for another reason as well, not only was this Jacob’s first elk hunt, but he would be the first in his household to hunt elk, ever. 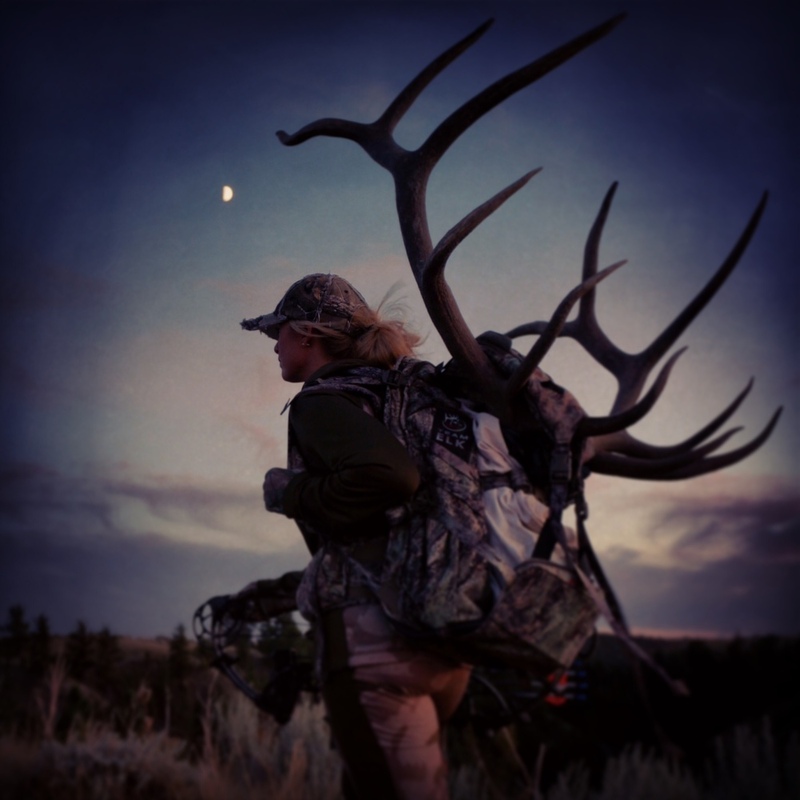 Be sure to tune into Team Elk Season 4 on the Outdoor Channel to see the time honored tradition of elk hunting be passed down from the Ellis family to the Taylor family, extending the legacy of the land and her grace for us all to enjoy. 12 year old Emmett palmed his Buck knife in preparation to skin his first ever deer, a Blacktail doe. His grip was firm but unsure; he was looking up to 18 year old Paxton and 16 year old Mikayla, veteran hunters for guidance. This was my second time coming to Black Oak Outfitters in Roseburg Oregon with outdoor writer Gary Lewis to mentor youth hunters in pursuit of their first deer. Paxton and Mikayla have been doe hunting here for many years and have mentored numerous other kids with their first hunt success. Two years prior, I was den mother in camp while 16 year old Alexa harvested her first deer. Paxton, Alexa and Mikayla were all back in camp to mentor 12 year old Emmett in his pursuit of a Blacktail doe. Kids literally creating their own hunting legacy, together creating memories that will last them all a lifetime. The Oregon youth mentor program allowed my tag to be filled by Emmett in the rich landscapes of southern Oregon. The area hosts the perfect habitat for the Blacktail and whitetail deer to flourish, the perfect target rich location for youth hunters to harvest their first deer. The doe was spotted feeding 70 yards away in the grassy oaks. Emmett had practiced in camp, taking aim and dry firing on trees, he was ready and without hesitation. Working the bolt, clicking the safety off my Browning .280, Emmett took aim and made a perfectly placed shot dropping the doe in her tracks. Often times there is strength in knowing that someone else has been in your shoes, Emmett drew confidence in knowing that the other youth hunters that surrounded him were there to help him field dress his very first deer. All of them giving him tips on where to make the incision in the cape, how to hold the skin taught and even the angle of the knife. Watching kids help one another is one of the most precious moments that life has to offer. Everyone in our camp was there to help fulfill Emmett’s dream of hunting, everyone was part of this once in a lifetime memory. 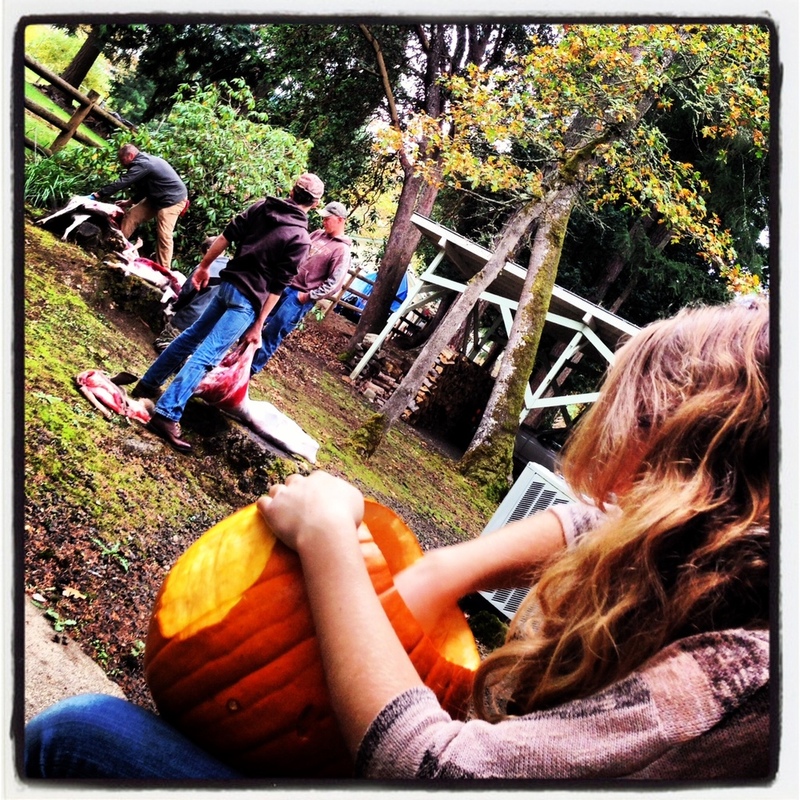 Gutting pumpkins and skinning deer with kids, that is how I want to celebrate Halloween every year. The snow lay scattered across the ground crunching under foot as we made our way up the mountain. The cold air stung at my face; this was my first glimpse of winter for the year. The Aspen trees had started to turn a rich shade of gold, not yet fallen to the ground. Winter surely is on her way. Amongst all this quiet an eruption has just happened; a frenzy that is not only heard but felt along the ground. There is a waking in the forest that has brought the bull elk back to the peak of the rut. A late estrous cycle from a cow elk has been sensed by the bulls. Her late need has him frantic running up and down the ridge top screaming and giving chase. Desperately, he is trying to separate her from the other cows and lesser bulls that have also gathered sensing her urgent need to be bred. This late in the year hunting elk, I expected to find herds of bachelor bulls quietly gathered together after the frenzy of the rut had wore off, making their best effort to put on much needed weight before winter really set in. It seems as if all the animals are desperate to feed with the coming of winter. We spotted the mountain lion sitting on his haunches watching the herd, awaiting his moment. He too was called in by the same fervent eruption that had brought us closer. The desperate hunger that winter strikes in all wildlife makes the lion an even more deadly force. Mother Nature always delivers adventure and this was my first time hunting the same herd of elk side by side with a mountain lion in broad daylight. 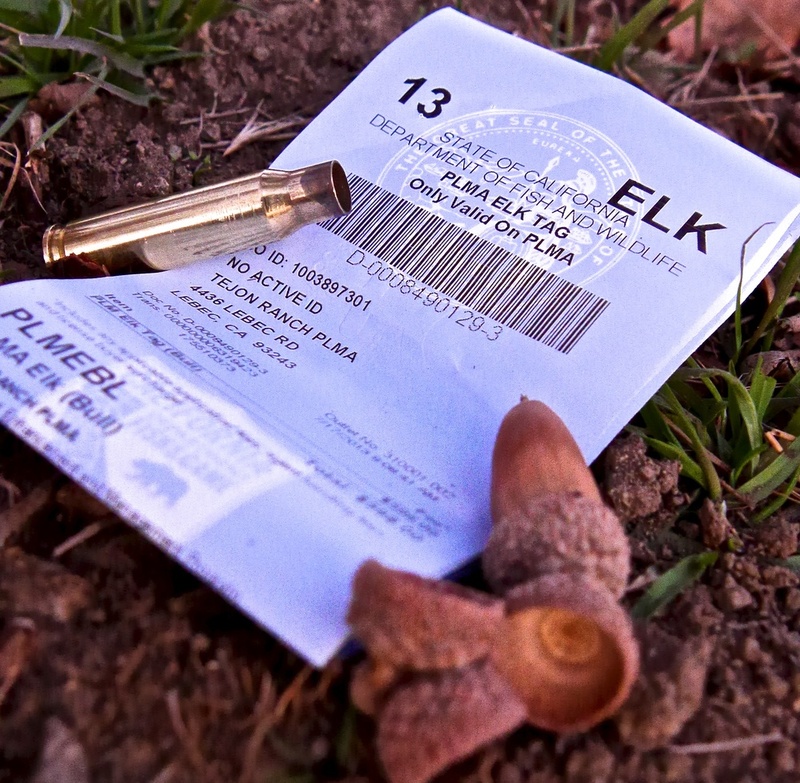 Be sure to tune into Season 4 of RMEF’s Team Elk airing on the Outdoor Channel beginning in January to see how this hunt transpires. There is nothing better than the laughs shared in hunting camp. The smell of the rut clung thick in the air and I could not help but pause in delight. The warm breeze was at my face, closing my eyes, tipping my head slightly back I took in the fragrant aroma of the rutting bulls. This surely must be what heaven smells like; at least it is for those who love to hunt elk in the peak of the rut. I was surrounded by the sound of raging bulls in their relentless pursuit of a ready cow. Some bugles were guttural mixed with growls and glunks while others were high pitched, squeaky in sound as if they were just learning to sing. The bulls were racing to sound off their voice with the hopes of drawing a needy cow to them and also to warn off other bulls who might think of entering their domain in an attempt to steal part of their harem. The frenzy was so hot that the direction the wind blew was nearly irrelevant. These bulls seemed not a care if they smelled me, no they had one thing and one thing only on their mind; the frenzy of the rut. The herd bull running non-stop circles around his harem, checking each cow over and over again so not to miss the opportunity of her readiness. Younger satellite bulls inner mixed within the herd were sure to stand clear of the herd master for getting in his way or enticing a challenge would surely get them either beat up or kicked out of the herd. The cantankerous herd bull would select random lesser bulls even if they were minding their own business and run them out of his circle with ferocity. He meant war; he would not back down, willing to fight to the death. The entire herd responded to his dominance, even the un-ready cow would run and dodge his fury quickly with the attempt of blending back into the herd and avoiding his charge. Cows, calves, spikes and satellite bulls responded and obeyed his ferocious bugle letting the sound drive them to and from bed, water and feed. 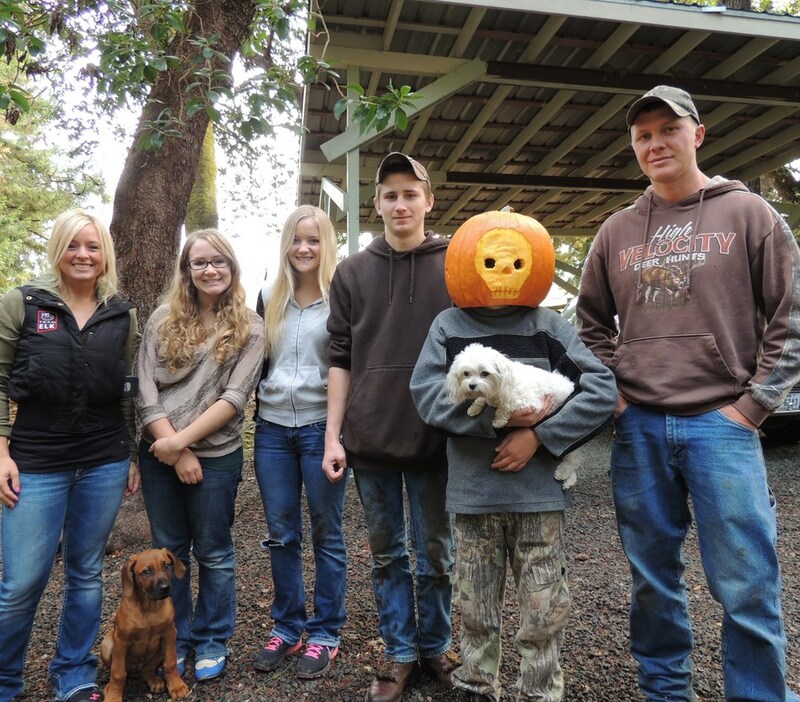 The entire herd submitted to him. He is Royal…he is king of the mountain. The distant sound of the wayward bull’s bugle would sprinkle the air, drawing closer and closer to the sound of the frenzy. He could not resist, he too wanted in on the upcoming action and would trot for miles to get in the middle of it. Screaming in often times to simply find that he was lesser, quickly backing off before feeling the fury of the herd bull. The occasional bull will step up to the challenge and go toe to toe with the dominant master of the herd. The sound of crashing antlers fills the air as the desperate challenger hopes to take over the thrown. Tines are broken from the force, bodies are stabbed, mangled and scared from the brutality of the fight. Only the grittiest of bulls stand up to the challenge but there is room for only but one herd bull. The prize is worth the fight as the dominant bull will win an all access pass to the gathered harem. Finding a mature old bull, worn hard from the battle is easy to spot. He will have scars on his face, neck and body, tines will be snapped off his main beams, his body lean from the relentless pursuit. He will bugle when other lesser bulls dare not, the king makes himself known. He is un-mistakable, he is what dreams are made of. A New Mexico management elk hunt on the UU Bar ranch is truly an elk hunters dream come true and I found myself absolutely awe-struck. This is my version of heaven on earth. My hunt is for a special king of sorts. I am not looking for your traditional “trophy bull” but instead an old bull that has reached his genetic maturity and is possibly somewhat of a “freak” or a bull that simply will never be a 6 point or greater in size. Newly appointed ranch manager, John Caid has spent all year looking over the herd at the UU bar and is working diligently to improve upon the current habitat enhancement program coupled with a revamped breeding management program. Continually enhancing the habitat of the 180,000 acres of the UU bar ranch benefits not only the elk, but also the abundant numbers of mule deer and antelope. The aggressive breeding management program will not only help to remove undesired genetic traits found with some of the bull elk but also afford the opportunity for the average harvested age of the elk to increase. This alone ensures a long abundant life for the bull elk on the UU bar. True stewards of the land and wildlife, the UU bar ranch is helping to ensure the future of the next generation of elk and also elk hunter. Be sure to tune into Team Elk Season 4 on the Outdoor Channel to see and feel for yourself the relentless pursuit of the rut in a place that I call heaven. The morning was unusually cold, 29 degrees, the frost lay thick on the ground and your breath clung to the air, seemingly frozen in time. The herd bull was on his feet and screaming following his cows closely. Screaming bulls in the frenzy of the rut, these are the moments that elk hunters dream about every night, year round. This is the moment that I have been waiting for. I love hunting elk in my home state of Oregon and this year, for the final days of archery season, I found myself near Heppner Oregon at the Opal Butte Ranch with fellow Oregonian and conservationist Ryan Cade. Opal butte, a 10,500 acre ranch is named after the rich opal mines that can be found within the heart of the mountain. The terrain at Opal Butte is nearly identical to what I am used to hunting on public land with my friends and family in Oregon. Open expansive mountains, dusted with pine and juniper trees. The ground is covered with rocks and a thick blanket of pine needles. The dry ground crackles like popcorn underfoot making being stealthy and quiet nearly impossible. The mountains boast a seemingly endless series of draws and timber pockets, the perfect setting for elk to hide in what appears to be wide open terrain. Western landscapes are always deceiving like that. Elk appear and then vanish into the wide open. The dominant bulls were settled in with their chosen harem, satellite bulls patrolling the perimeter of the herd for an opportunity to steal a wandering cow. The cows do not dare wander too far from the herd bull as his screaming call keeps them tucked in close to him. His desperate bugle can be heard a draw away and if you are lucky enough, there are times that you are so close to a bull elk that you can feel his whine rumbling across the ground. 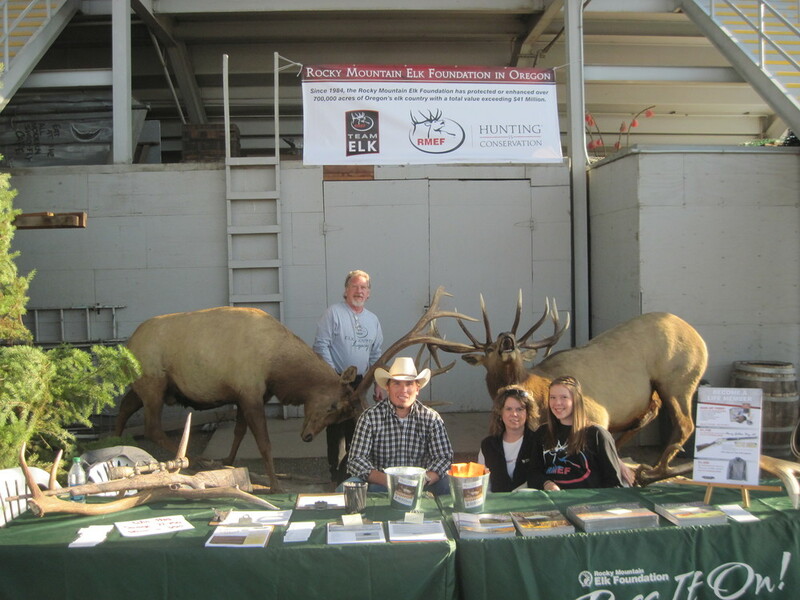 Ryan represents one of RMEF’s outstanding partners, Danner Boots, a unique company with a genuine commitment to conservation and un-wavering support of RMEF and its missions. Be sure to tune into RMEF’s Team Elk Season 4 on the Outdoor Channel to see how this home state hunt transpired for Ryan and I. Today we took a day off from our photo shoot and went TURKEY hunting:-)!!!! Ramsey Mills and Rob Burnett, Cabela's Women's Footwear Category Manager(s) have been talking with me about coming to Nebraska to hunt Merriam Turkeys since SHOT show and I could hardly wait for this day to arrive! Nothing beats a day in the woods hunting with friends. At 5:00am sharp our journey began with an hour long drive to Ramsey and Rob's hunting lease. A beautiful stretch of river bottom property in Nebraska. The morning started out cold and crisp but I barely noticed except for the fine layer of frost surrounding the barbed wire fences. At sunrise, the sun glistened off the wire creating a sparkly ice show. Within minutes of setting up our decoys we heard a tom gobble. Shortly thereafter in strolls a hen. Strangely enough, she was alone and nearly walked over the top of Rob as she cruised by us and our decoys. I went from high adrenaline to questioning what had just happened. This time of year, a hen is rarely alone and I sat there in disbelief that a tom did not strut in behind her. Rob and Ramsey decided that we needed to make a move down the river bottom in pursuit of more cooperative turkeys. Along the way Ramsey found a whitetail shed. No gobbles...no turkeys. Back to square one. 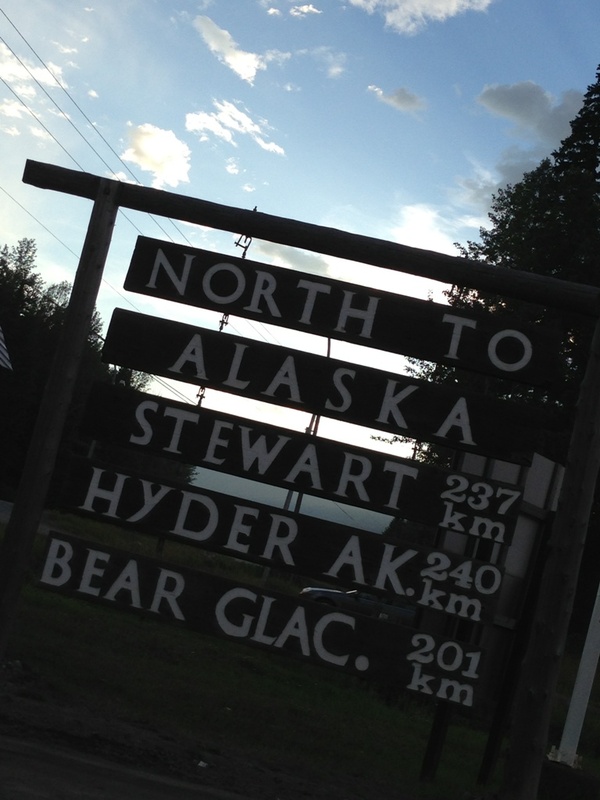 We head back down the river bottom where we just came from and what do we see? Three strutting toms and hens galore...right where we had been sitting a mere hour earlier. Patience was not our strong suit today. We set back up with an attempt to call in one of the strutters.The gig was up when we heard the turkeys take flight and cross the river. Fortunately for us, Rob has a brand new Argo and this was a perfect opportunity for her maiden voyage. What a better way to break her in than chasing after a flock of turkeys!?! Plus, I have always wanted to ride in an Argo after spending years watching Jim Shockey take on the Yukon behind the wheel of one. Rob and his Argo maiden voyage... Jim Shockey has nothing on Rob's mad Argo skills! Tricky spot here... The maiden voyage has only taken us 40 yds from the truck & we are stuck with one tree wenched over. OOPS Second tree wench did the trick. Turned the Argo around and BAM!!! Stuck again!!! You can feel the intensity of Rob & Ramsey in this picture. Hooking her up to the diesel!!! Got ER' Done!! !Needless to say with all of our Argo adventure, we ended up not getting on the flock of turkeys. 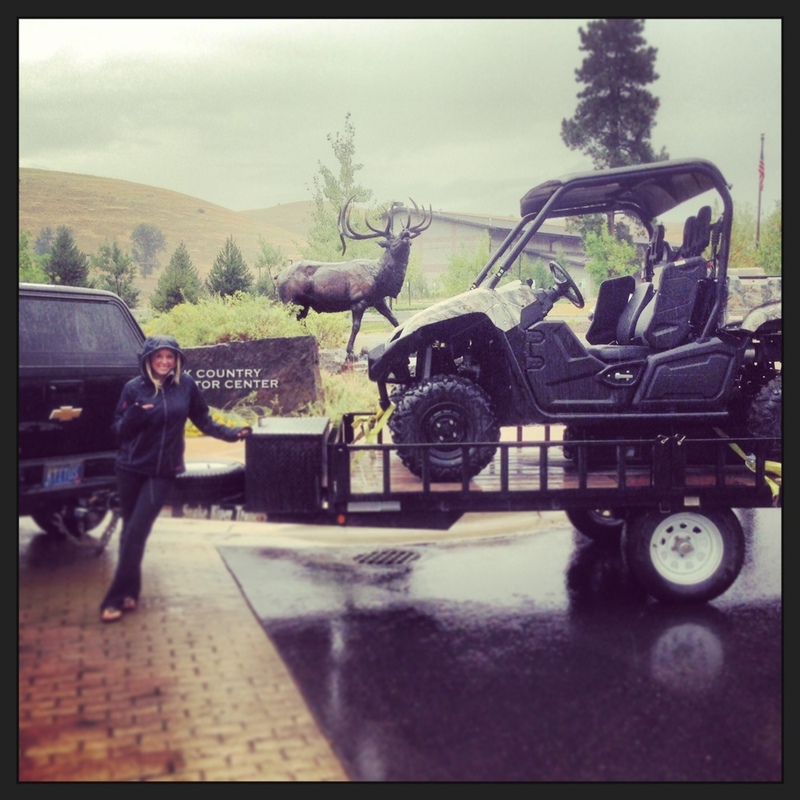 Jim Shockey makes navigating an Argo look so easy. It was nice to be in the woods on a beautiful day, away from the hustle and bustle of life and cell phones with the company of friends and a pretty fun adventure to boot! Turkey or not, we had a great day!!! Spring has finally sprung and the thunder is rolling...Thunder Chickens that is!!! After a long winter and few hunting opportunities, Spring finally arrives and with it comes the excitement of Spring turkey season. Opening morning was bone chilling cold, but despite that with high hopes, myself, Mikyla and Mike Jahnke all climb into the blind. Mikyla is up as shooter, I am on camera and Mike is caller. Turkey hunting from a blind can be challenging, double that when you are trying to capture the "moment" on camera. By 7:00 am we have a strutting tom called into our decoy. I can see him and he is framed up perfectly on camera BUT Mikyla cannot see him. With the tom's keen eyesight and high level of awareness, she cannot move to make the shot. A moment that did not come. That is hunting, so close, yet so far away. Shortly after our morning encounter, Mikyla made the responsible move and went to school on time, without filling her turkey tag. Sometime later that morning, we call them in...four crazy jakes, strutting around, mounting decoys, anxiously trying to figure out what to do next when in strolls Mr. Long Beard. Oh yeah, I am shaking, ready for my shot. I'm on the gun, camera rolling, everything is perfect, except for the fact that the four jakes had already laid claim to the decoys and they were not going to allow Mr. Long Beard to take up shop and strut around. The chase was on...the jakes put the run to Mr. Long Beard and he was gone as fast as he came. When Mr. Long Beard tried to come back, he was again chased off, and a third time. Opening morning turned out to be an action packed no shot opportunity hunt that was left me shaking with anticipation. This why we love hunting! Time to re-group. For our evening hunt, Mikyla rejoined us and we came up with the plan that if one of the long beards came in, Mikyla would take the shot and if the pesky jakes came back, I would take the shot with my bow. One way or another, we were bound and determined to tag a turkey. Here they come...jakes on parade once again strutting up our decoys! This time, I am ready, bow in hand, I take slow careful aim and let my Easton arrow fly. With a perfectly placed shot, my jake is down less than 10 feet from where my arrow passed through him. SUCCESS!!! My first archery Rio! I felt bad for Mikyla that Mr. Long Beard never showed up that evening, but we were glad to take home dinner instead. What a great way to close out opening day of turkey season. The next morning, with a second turkey tag in hand, Mike and I set out in pursuit of Mr. Long Beard. It was cold. Really cold...36 degrees and our breath was the only thing that was to be seen. No turkeys, no gobbles...no bueno. Not even one of the remaining pesky jakes will come into our calls, possibly a bit wiser from the day before when I took one of their own out of the equation. Shortly after 10:00am Mike and I decide to abandon our location to try another spot and we get all settled in at the truck to leave when far in the distance we hear it; Mr. Long Beard gobbling. Like a flash of lighting, we were back out of the truck, racing to set up our blind and throw up the decoys. Mad chaos had set in and the adrenaline was flowing! I could literally hear my heart beating in my ears, but no gobble. Here comes the doubts...did he see us, did he hear us, did we bump him or do we just need to have some patience? The sound of a tom turkey drumming his feathers is absolute music to every turkey hunters ears. The sound of Mr. Long Beard drumming his feathers had my hands shaking and my heart pounding. He was close, really close. My camera was set up and ready to record, aimed at the decoys, so of course, he strolls everywhere but up to the decoys. Mr. Long Beard makes a giant circle around us holding strong at 80 yards but will not close the gap to our decoys. My guess at this point is that he is scared of the jake decoy given the beat down that he had received the day before. Mike and I came to the conclusion that he simply was not going to come into the decoys. We made our move, windows went up so we could move within the blind without detection. Once the camera was re-set and we were in position, we opened a window with the hopes that Mr. Long Beard was still there. Thankfully, he was. Now the waiting game...he was scratching the ground just over 60 yards from me, just out of reach for my Browning BPS 20 gauge. Here he comes, ever so slightly towards us, just enough to place him within range and unfortunately for me, he stops and struts just behind a tree. No shot. Waiting and hoping; finally, he takes those two small steps into the open and with one gentle squeeze to the trigger, he is down. Perfect end to a perfect hunt!!! With my tags filled, I stuck around Southern Oregon long enough for Mike to fill one of his tags with this stunning Rio. Unfortunately, I had to leave before Mikyla filled her tag but the best of luck goes out to her. I am looking forward to getting photos of her hunt success. When it comes to turkey hunting, it just doesn't get any better than this!! Thank you Mike and Mikyla Jahnke for everything!